Home » PICO-8 – 32K-arat Gold! There are a lot of interesting options for game development on the web these days, many that exist in their own quiet little communities, and while anyone with even a passing interest in game development knows Unreal, Unity, and RPG Maker, it’s easy to overlook these hidden gems. Last year I discovered a “fantasy console” called the PICO-8 which had released in 2014 (version 1.0 released in 2017) and had already been the progenitor of hundreds of quirky little free games. But what is a fantasy console? A fantasy console is essentially a development environment with its own text editor, sprite editor, map editor and tracker for creating sounds and music. On top of this, these fantasy consoles are designed with strict restrictions for colour, RAM allowance, file size, or graphical resolutions. To encourage creative thinking and problem solving, the PICO-8 has some very strict requirements. The PICO-8 is altruistic in that it feels reminiscent of the old-school BBS days where each game can be uploaded and shared online through a special .png format, via a web cart player, or exported to stand-alone HTML5, Windows, Mac and Linux apps. On top of this, players can see the source code for the games to understand the tips and tricks of other developers. It cannot be understated how useful a tool for newbie developers looking to understand how a game is put together this is. Heck, I’ve been to university for game design and this is still useful! PICO-8 cartridges are tiny programs that run in-browser or through the PICO-8’s cartridge browser. 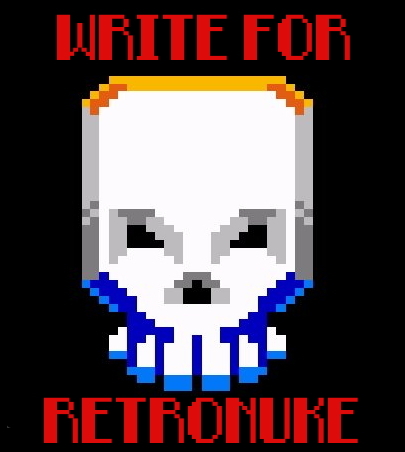 With the strict limits of the system you’d be pretty hard pressed to find a game that won’t run on even the most archaic of laptops (Retronuke makes no guarantees, hyperbole is the spice of life). After browsing through the available games and picking out the ones that I found most interesting, here are my top picks. Kid Bludd’s Treacherous Tower takes the a lot of inspiration from the Taito classic Bubble Bobble. However instead of the old bubble attack, Kid Bludd has a dash attack that feels responsive and powerful. Like Bubble Bobble hitting an enemy isn’t the end. In this case, the enemies are launched around the level, bouncing off the sides and wrapping from bottom to top until you hit them again. Chain a nice combo up and satisfaction is guaranteed. The 8-bit vampire castle art style is wonderfully done and keeps everything crisp and clear. My only complaint about Kid Bludd is that for now, there are only 5 levels. Hopefully the developer continues working on it. This one is full of charm and wonderful jazz inspired blips and bleeps. You play as Max the saxophone player trying to keep your sax solo going as long as possible. Trumpets spawn and are tossed at you, dodge them or stop them with your music to earn points. Its wonderfully simple and works perfectly but it’s purely the music that gets it into my list as the procedural nature of the notes makes for a great digital representation of freeform jazz. An interesting trend among PICO-8 developers is to take an existing game and to boil it down to its core design. In this case Dungeon Keeper gets an interesting arcade-ification. The player controls a host of dungeon creatures, digging out gold and protecting their minotaur king from meddling heroes. While the game lacks any tutorial documentation, a few attempts is all it takes to get to grips with what’s required of you. Namely, strategic planning as your monsters do not attack on their own except to defend themselves and cannot pass by each other. It has a wonderfully cartoony charm where each character has just a bit of personality dashed over their restricted sprite. As developers continue to share their work, tutorials are made, and code is refined, we’re seeing a repeat of that same explorative golden age. There are already 3D games that developers have managed to cram into a 32K file. If you would like to get into game development as a hobby then I would definitely recommend the PICO-8. For only $14.99 it is a versatile and interesting tool and gives you access to its own dedicated content portal which is always great. You can get the PICO-8 Here and you can play free cartridges Here. Freelance writer and game developer, Anna loves to create but is burdened with a short attention span so has a dozen projects spinning like plates. When she gets the chance Anna can be found putting herself through hell in Rimworld or They Are Billions.